Comics In 5 Panels: Cartoon Month: Adventure Time. Meet Finn, the last human on the planet, and his best friend/adopted brother Jake, a magical shape-changing dog. Together, they go on all kinds of adventures in the land of Ooo. Anything from saving Princess Bubblegum of the Candy Kingdom from the crazy Ice King, fighting monsters or go on treasure hunt. Anything is possible as well as allowed in Adventure Time. Weird cartoons are nothing new. But this show managed to give us something a bit... different. Remember being a kid playing with Lego, or on a playground? It's not like a role-playing game with rules. Your imagination allows ANYTHING to happen. A huge dragon can come to your kingdom and throw up goblins in your face, and only your cool sword can cut that overgrown lizard to pieces. Or you are lost in a labyrinth, and has to run for it before you get eaten by a horde of bugs, and then Pikachu saves you. All those weird games you played as a kid had nothing to do with all that dumb grownup stuff such as LOGIC, REALISM, or any of that poophead junk. That's the essence of Adventure Time. There are no rules. Anything can AND will happen. Finn and Jake goes on wild out-of-control adventures, yelling made-up word no one would normally use if they were older than 12. ... Aaaaand then it hits you in the feels. This show manage to be surprisingly deep. Because of all the silly playground action, it takes you totally off guard when they decides to make a serious(or more or less serious) episode. It works surprisingly well, like when we take a close look at the Ice King, (a character usually ridiculed), and realize that he is actually pretty tragic. And we realize that the sweet and kind Princess Bubblegum MAY not be that sweet after all, and that she runs her kingdom with an iron fist. My favorite "serious episode" is the one called "'Princess Cookie" that is... surprisingly dark compared to the rest of the show. Seriously, it made me more depressed than anything else. I'm actually unsure if I would let a child watch it. Adventure Time has something for everyone. The kids can enjoy the awesome, mathematical, fartastic adventures, and the elder siblings/parents/adults who watches kids shows for some weird reason can enjoy the surprisingly intelligent and subtle humor, as well as analyzing the episodes. And even though it's pretty chaotic at first, then it has a interesting fantasy-universe that you can explore, analyze and make theories about. 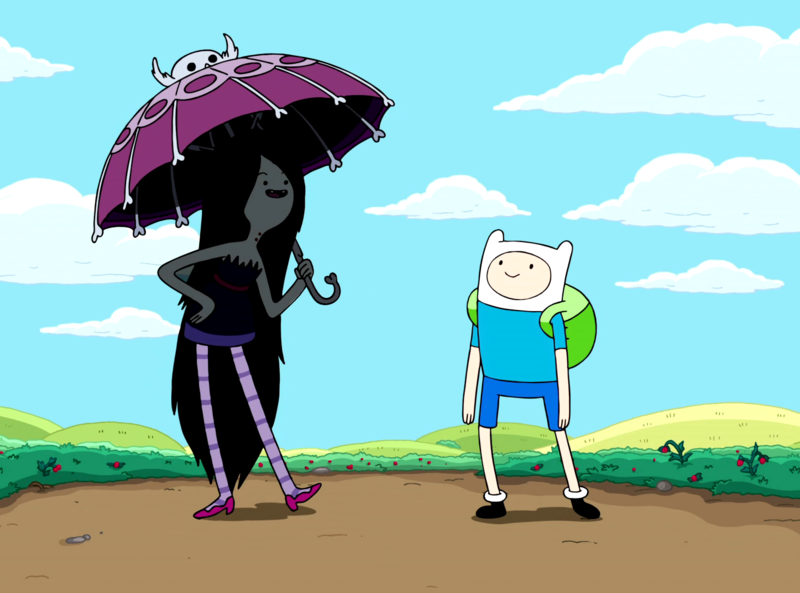 And it has plenty of great characters, such as Marceline, 3/4 of the fans favorite character. That's all for now. I'm Waezi2, and Bubbleline forever. FP is great, but my favorite character is Hunson Abadeer. Sure thing, it's on my to-buy list.